Gavin joined Peacock, Linder Halt & Mack LLP in 2010, having previously been a partner at a major international law firm in Calgary. He has been counsel at all levels of Court in Alberta, before administrative tribunals and regulators, and in arbitration and mediation nationally and internationally. He has extensive experience in complex commercial litigation, specializing in class actions, oil and gas, securities, construction, insurance, and disputes among corporate shareholders and partners. Gavin is the firm’s managing partner. Gavin has been counsel before both Courts and administrative tribunals on matters related to the interpretation of leases, offset well obligations, accounting, review and variances, applications for approval of enhanced recovery schemes. Represented a multinational oil and gas company in a contested week-long hearing before the ERCB seeking approval of an amended waterflood scheme. Represented a major multinational oil and gas company in litigation alleging breaches of a lease agreement, including offset well obligations and equitable issues. Represented an oil and gas partnership at trial in a dispute related to interpretation and application of the Income Tax Act and Alberta Corporate Tax Act to entitlement and timing of Alberta Royalty Tax Credits for corporations carrying on business as a partnership. Represented freeholders and a top lessee in a long trial and subsequent appeal with respect to issues of lease termination. Represents mines and minerals owners in disputes with respect to allegations of lease termination for want of production or operations. Represents individual freeholders with respect to claims arising from offset well obligations and unpaid royalties. Represents various owners and contractors in contractual disputes arising from the provision of services to the energy sector. Represents pipe suppliers in disputes alleging faulty product resulting in plant or well failure. Gavin has advised and represented insurance clients on a wide range of coverage issues arising from Commercial General Liability and Property All Risks policies and such events as oil spills, saltwater contamination, pollution, flood, business interruption, plant shutdowns, and mechanical failures, and involving substantial claims in the hundreds of millions of dollars. Gavin has also advised and represented both individuals and corporations in disputes with insurers with respect to coverage claims and duties to defend, ranging from individual homeowners with issues arising from flooding in Southern Alberta to contractors and sub-contractors in construction disputes to major oil and gas corporations with complex issues and very large claims arising from damages to pipelines, batteries, and processing facilities, and resultant business interruption in both conventional and oil sands contexts. Gavin has acted as an umpire in the resolution of disputes pursuant to the provisions of the Insurance Act. Represented a multinational group of insurers in an international commercial arbitration alleging material nondisclosure. Represented a multinational group of insurers in a complex series of losses in the United States and Canada. Represents condominium owners in a dispute with an insurer related to alleged construction defects. Represents condominium boards and business owners in disputes with insurers arising from flood damages. Gavin has been active defending class actions since class proceedings legislation first came to Alberta in 2004. He has acted on behalf of major national and international companies and financial institutions defending employment class actions, payday loan class actions, class actions alleging ponzi schemes and breaches of trust, and securities class actions. He has appeared before both the Court of Queen’s Bench of Alberta and the Court of Appeal and has argued at certification motions, summary judgment applications, and various interlocutory matters. Gavin has also successfully settled class action disputes with Court approval. Gavin has also pursued class action proceedings on behalf of plaintiffs, including claims with respect to alleged faulty condominium construction and allegations of shareholder oppression. Represented a major Canadian financial institution in defence of a class action alleging knowing assistance or participation in a ponzi scheme with losses in excess of $100 million. Represented a California based financial institution in, and settled with Court approval, a class action alleging involvement in a ponzi scheme. Represented a multinational company in, and settled with Court approval, a class action arising from employment and termination of employment of a class of workers. Represents condominium owners pursuing a claim against the condominium developer and insurer alleging construction defects. Represented companies in the payday loan business in defence of a class action alleging breaches of Criminal Code interest rate provisions. Represented a former officer in defence of various class actions in Alberta and elsewhere alleging statutory and common law breaches of securities laws. Gavin has represented owners and contractors in disputes arising from builders’ liens, bonds, construction delays, cost overruns, and faulty design or construction. While these have often been resolved to the parties’ satisfaction before a formal hearing, Gavin has been counsel in construction disputes before the Alberta Court of Queen’s Bench, the Alberta Court of Appeal and in a major international commercial arbitration conducted jointly in Calgary and London, England. Represented a major oil and gas company in a lengthy trial and before the Court of Appeal in a dispute between an owner and a contractor about liability for cost overruns and delays on a pipeline construction project governed by a cost reimbursable contract. Represented a group of insurers based in Canada and Europe in a major international commercial arbitration involving claims in excess of $200 million focussed on cost overruns and schedule delays arising from construction of a major oilsands project. Represented a processing plant owner in an arbitration commenced by the contractor seeking payment for various cost overruns and costs occasioned by delays. Represents a manufacturer and supplier in shareholder/partner disputes. Represented a foreign plant owner in dispute with a bank and contractor over receipt of payment from a $5 million performance bond letter of credit. 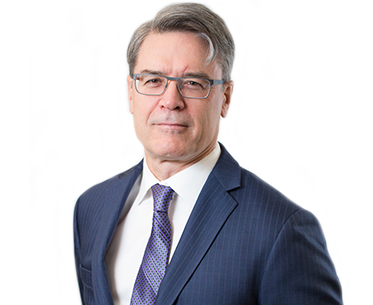 Gavin has advised and represented clients before the Alberta Court of Queen’s Bench and Alberta Securities Commission in arrangements, amalgamations, disputes with dissenting shareholders, hostile takeovers, oppression claims and derivative actions. Represents a former officer in defence of various class actions alleging statutory and common law breaches of securities laws. Represents former corporate officer of a public company in regulatory proceedings arising from allegations of breaches of securities law. Represents a general partner in a dispute with limited partners. Has represented and assisted general partners and partnerships in partnership disputes. Represents shareholders and directors both pursing and defending oppression claims. Represented a major multi-billion dollar international company and its directors in defending claims of oppression and breaches of duty. Acted for an international digital payment solutions provider in a trust dispute with a domestic financial institution. Represents a large multinational company defending a $125 million claim arising from the procurement of international oil and gas rights. Represented a U.S. based development company in litigation alleging wrongful termination. Represented a multinational company in heavy industry in Occupational Health and Safety prosecutions arising from workplace fatalities. Represented a major accounting firm in defence of allegations of wrongful termination and entitlement to disability benefits. Represents and has represented various employees in disputes with their former employers alleging wrongful dismissal. Represented a major transportation company during investigations of alleged wrongful conduct and subsequent termination of employees. Represented a multinational company in litigation against another industry participant alleging breaches of fiduciary duty and misuse of confidential information by a former employee. Represents employers in defending claims of wrongful termination.